In our 19 JAN 17 post on the Western Free Press website, NEC-SE predicted the coming course of operations for driving ISIS forces out of west Mosul. Iraq Army forces will be pulled out of east Mosul, to be replaced by Iraqi federal police units, which will secure ISIS hold-outs that may reconstitute in that section of the city. The Iraqi Army forces will be redeployed west of the city. When the time comes, Iraqi Army forces along with Kurdish forces in the vicinity of Sinjar and Iranian-aligned militia units positioned south and west of Mosul, near the city’s airport, will launch a multi-pronged offensive into west Mosul. Police units quickly moved into the village of Athba, about 3 miles (5 kilometers) southwest of the airport, encountering only light resistance, according to an AP reporter traveling with them. Separately, the army’s 9th Division moved into the village of Bakhira, also southwest of the city, the Iraqi Ministry of Defense said. AP further reports that “Iraqi special operations forces, regular army and federal police units are taking part in the offensive along with government-approved paramilitary forces, mainly consisting of Shiite militias, which are operating on the city’s outskirts. The Shiite units are the “Iranian-aligned militias” we referred to in our post. Coalition warplanes (including U.S. aircraft) are conducting strikes on Daesh positions in support of the ground forces. Assyrian military forces are involved as key partners in the operational and strategic dimension of the Mosul fight. West Mosul is the “old city” with narrow winding streets that favor the defense. And the defenders are, as stated, willing fight to the last man. Even so the outcome is assured. 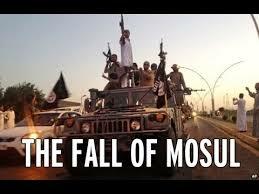 ISIS will be eradicated in Mosul. ISIS mainly has itself to blame for its soon-to-be-realized demise. It established a reign of terror over the territories it conquered, alienating the populations under its control. Most of those populations want ISIS dead and gone. NEC-SE firmly believes that the ISIS’s days in Mosul are numbered. In our 19 JAN post we predicted that Coalition forces will secure west Mosul “no later than the first week in April.” We stand by that prediction. We fervently hope that the end of fighting in Mosul will see all groups involved in the battle staying in their respective sectors and avoiding sectarian conflict. And we urge the leaders of those groups to refrain from using the coming victory as an opportunity for territorial gain. To do so would be an insult to the brave soldiers who fought to free the city from Daesh oppression. If the politicians do not understand their limits than the region will be engulfed into a larger war that will continue in the region through 2018 and will see the possible use of weapons of mass destruction in the current operation. 20 FEB 17 Interview of LTC Sangari by Assyrian Universal Alliance Australian Chapter Radio Program “Qalid’ Khoyada” on Assyrian Issues and Topics.